Undoubtably one of the most colorful native bird species in the continental United States, the Painted Bunting is a joy to see for birdwatchers in the Southeast and southern Midwest. In the greater Wilmington area, Painted Buntings can be found within 1 mile of salt water. The males have the familiar coloration (blue head, bright red underparts, and bright green on the wings and back). Females and juveniles are a green color, however the juveniles on average tend to be a more drab brown/green while the females are brighter green. 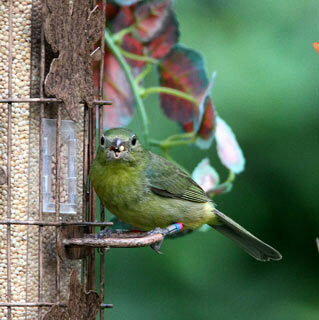 These birds are the only solid green finch-like birds that live in our area. Young males will remain green until the fall of their second year, when they finally molt in their bright colors. 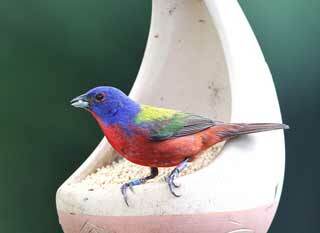 If you would like to attract Painted Buntings to your home, make sure you are within 1 mile from the coast. 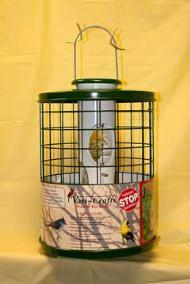 The best feeder to use is a caged feeder like the one pictured at left, filled with white millet. As adults, Painted Buntings are granivores (they only eat grains/seeds), and white millet is one of their absolute favorites! At Wild Bird and Garden, we stock both the cage feeders and pure white millet (in 5lb and 25lb bags). Adult Male in Adult Plumage (left) sits next to an Adult Two Year Old Male Molting into his Adult Plumage (right). Notice how his chest is starting to turn Red! Cage Feeder. Keeps Squirrels and Bigger Birds like Grackles and Blue Jays Out. 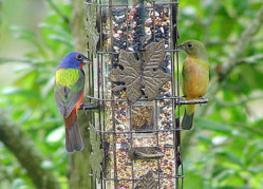 Juvenile Painted Bunting. It is more brown and slightly smaller than the female.